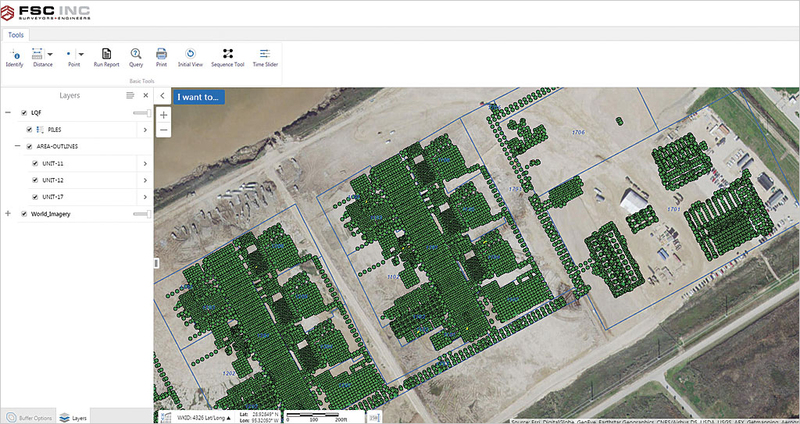 GIS integration into construction surveying has provided the multidisciplinary engineering firm FSC, INC., and its clients with a powerful new tool that enhances data management, project management, quality control, and cost reduction. Construction surveying provides the critical link between exact design engineering and precise on-the-ground layout of industrial facilities. Industrial construction facilities often require deep foundations that transfer building loads farther into the earth than shallow foundations. The vertical structural element of a deep foundation is generally referred to as a pile. A pile is typically a column of strong material, such as steel-reinforced concrete, that is sunk deep into the ground to provide underground structural support. The project viewer was used to show installation progress and analysis to the project stakeholders. The specifications for piles depend on the geotechnical characteristics of the ground as well as design aspects of the facility. To achieve engineering load capacity and overall strength of the facility foundations, optimal placement of support piles—both horizontally and vertically—is paramount. At multiple project sites, FSC, INC., provided precise construction layout as specified by detailed engineering piling plans. These piling plans are designed with multiple pile types, each with strict engineered specifications and a unique location. To ensure te precise layout location of each pile, survey-grade GPS equipment is used to mark the location where each pile will be installed. After initial layout and installation, survey-grade GPS equipment is again used to verify that the as-built location for each pile falls within an allowable tolerance. One such project site alone contained more than 21,000 data points. The need for a GIS solution quickly became apparent. FSC, INC.’s GIS department developed a custom geodatabase to manage and store the tremendous flow of spatial data coming from each project site. Initial pile locations were transformed from an assumed grid coordinate system to a real-world coordinate system for use in GIS mapping applications. Attribute tables were populated and used to track pile specification details and installation information such as installation status, installation date, and as-built measurements. Because work was performed six days a week at each site, daily edits were necessary to provide up-to-date information on the project progress to various project stakeholders. 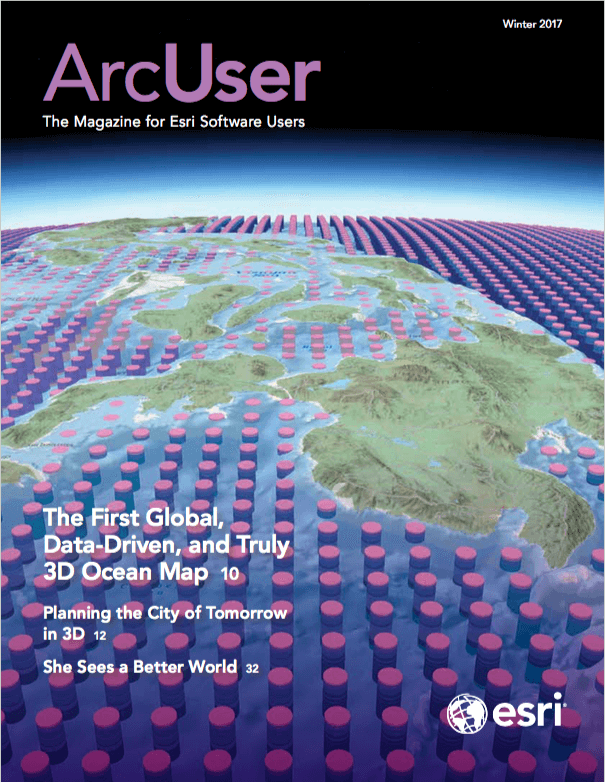 FSC, INC., also published the database to a GIS service using ArcGIS for Server. This service could be consumed by other GIS users in ArcMap. A more flexible method for sharing information with non-GIS users was also needed. The GIS team developed and hosted a user-friendly GIS web application, a project viewer, with Geocortex Essentials. Produced by Esri Platinum Partner Latitude Geographics, Geocortex Essentials allows quick and effective deployment of web applications. End users could access project data via the project viewer from virtually anywhere. This became a powerful tool for both field personnel and project managers in the office. Field supervisors could retrieve information instantly about a specific pile. Project managers could use the maps to aid in planning work and coordinating crews and machinery on the project site. The project viewer was also used to archive and retrieve as-built documentation needed to verify that installed piles met all tolerance requirements. Because the flow and accessibility of information was streamlined, project decision-making efficiency improved dramatically. 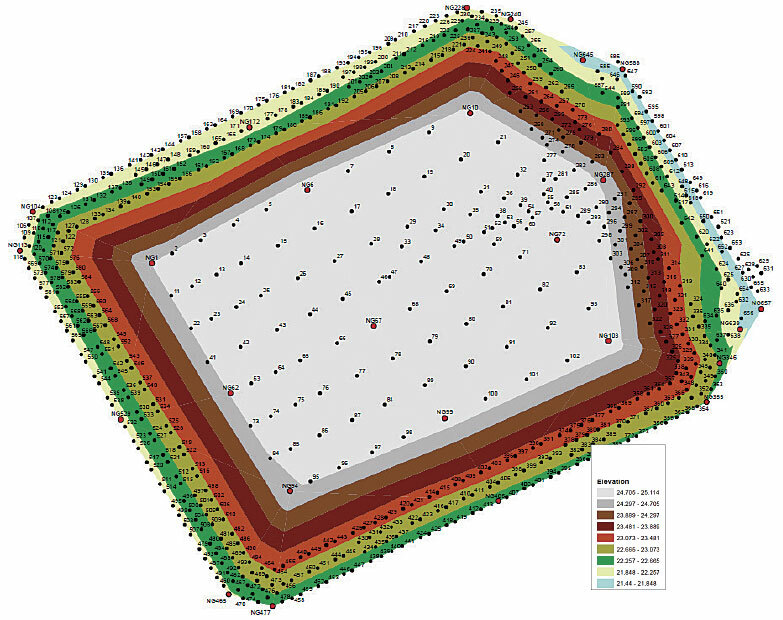 A 3D triangulated irregular network (TIN) surface generated to illustrate surface grade of an area prior to installation. In addition to precision pile layout and as-built verification, FSC, INC., used tools in ArcGIS to help calculate grade overburden. Before piles are installed, the project site surface must be prepared. The surface gradient is a critical component of correctly installing a pile, since each pile must be installed to a specific, predetermined depth. If too much surface material is present, additional construction material must be added to the pile to bring it to the correct elevation. For a large site, excess materials can add up quickly and cost the client hundreds of thousands of dollars. To recoup these costs, excess grade allowances are outlined in project contracts. However, calculating and documenting these costs can be tricky. Traditionally, a topographic survey is performed, and the excess grade is calculated by averaging the planned elevation and grade elevation differences in each series of piles. But by utilizing tools in the ArcGIS 3D Analyst extension, a much more accurate assessment can be made. A 3D triangulated irregular network (TIN) surface is generated based on natural ground elevations derived from GPS measurements, producing a digital model of the surface grade. From this model, elevations for each individual pile in the area can be interpolated. By comparing the interpolated elevations to the design elevations, accumulated overburden is calculated. This method yields significantly more accurate results than traditional methods of calculation, thus allowing the client to recoup more of the costs incurred from additional materials during the installation process. Implementation of these practices allows FSC, INC., to offer more comprehensive and robust services, making the company more appealing to clients for future construction projects. For more information, contact mparkinson@fscinc.net. Michael Parkinson has a bachelor's degree in geography from Texas A&M University. He was a GIS mapping designer for Phillips 66 Pipeline Company before joining FSC, INC., as a GIS manager. His current areas of expertise include database management, web application design, pipeline mapping, and unmanned aircraft systems (UAS) data collection for surveying and engineering.